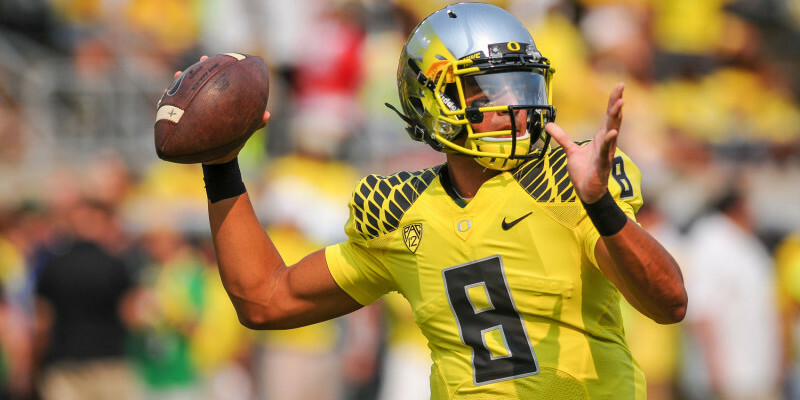 Earlier in the week, Oregon Offensive Coordinator Scott Frost appeared as a guest writer for Peter King’s Monday Morning Quarterback column on SI.com, giving the national media a rare view on the realities of Marcus Mariota. While he spent plenty of time defending the usual crticism and complaints of everyone’s favorite Duck, he also brought up something that I hadn’t actually thought about as needing to be addressed before: Mariota’s niceness. Apparently, unknown to me, there has been a movement of scouts and other so called “experts” who have decried Mariota for being too nice and not having the killer instinct that Jameis Winston has. While this isn’t set out to be another “Winston vs Mariota” (I’ve written two of those already which can be found here and here) I’d just like to point out that Mariota looked like the one doing all of the killing the last time both men were on a football field together. What Coach Frost had to offer up to challenge this idea of Mariota being Mr. Nice Guy are some interesting stories from practice that’ll have you calling him General Tso….cause he’s so spicy…get it? The first of these two stories recalls an incident where Mariota got so angry at practice that he ran over and punted a football out of frustration. I’d just like to point out how hilarious an image this is, at least to me. Nonetheless, it shows that Mariota does have some fire I guess, but with his record in college, how is his will to play and his fire even in question? I hate to keep bringing Winston into this, but does playing horribly for two quarters and then miraculously winning the game in the second half really show more will and determination than winning from the first quarter? Maybe if Mariota were routinely arrested or accused of crimes or acted like a giant 12-year old without his parents watching every chance he got, then his fire wouldn’t be questioned. Then perhaps Scott Frost wouldn’t feel the need to share stories about Mariota punting the ball in anger and being in the middle of a fight at practice. The idea that Marcus Mariota’s toughness, fire, determination or any other buzz word you wanna throw in is being questioned is ridiculous; if you want to question a QB in the draft, go see if Jameis is being accused of a crime this week.